Late winter is the time of year when I begin to resent my puffy down coat. I actually find myself staring at it with disdain. My body aches to sit outside (wearing a nontoxic SPF 70 sunscreen, of course) and feel the sun touch my skin, warming the muscles underneath while I fill my lungs with sweet fresh air. When I view these thoughts and feelings through the lens of my yoga practice, I know they are simply desires based on previous experiences of pleasure (attachment, or “raga”) or pain (aversion, or “dvesha”). They are a cause of our suffering, as we make every attempt to run away from the bad and chase after the good, which is sometimes unavoidable and part of the fabric of our human experience. Yoga teaches us that we have the freedom to choose the thoughts we think and, therefore, our responses to the “highs and lows” of life. It is winter, and spring is still weeks away. Now, I could bemoan this fact or accept it as truth and empower myself by practicing yoga poses designed to offer all of the gifts of a sunny spring day. What follows is a sequence that will stretch and strengthen a cold, winter body and uplift a dull mind. •	Stand with your feet a few inches apart, spreading them broadly and lengthening the toes forward. Press down evenly on the toes, balls of the toes, and the front and the backs of the heels. •	Keeping the top of the buttocks moving away from your lower back, lift the sides of the waist, the chest, and the sternum up towards the ceiling. •	Turn the upper part of the arms away from the sides of the chest, roll the shoulder blades onto the back lengthen your neck and head away from the tops of the shoulders. Self-study: Standing up straight has an effect on the position of your head and, therefore, your eyes. What happens to your eyes when you stand up straight and lift your chest? •	From Tadasana, keeping your shoulders pressing down, extend your arms from the center of your chest into your fingertips and raise them up to be level with your shoulders. Turn the palms up to face the ceiling, inhale, and raise your chest, sternum, and head and look up while stretching your arms overhead, bringing the palms together. •	Exhale and lower the arms back to Tadasana and look straight ahead. Repeat 3 to 5 times. Self-study: Taking the arms up and down this way has an effect on the sides of your trunk and your armpits. What is the feeling in those two places now? •	From Tadasana, step your feet 4 to 4½ feet apart, keeping your feet facing forward, arms raised up to shoulder level. •	Turn the left foot slightly in and the entire right leg out, taking care to see that the center of the thigh, knee, shin, ankle, and top of the foot are facing the wall on your right side. •	Keep the trunk of your body in Tadasana and, on an exhalation, while lifting the abdomen, chest, and sternum, bend your right knee, bringing the buttock bone down in line with the back of the knee. •	Maintain the full extension of your back leg and the stretch of the arms out from the center of the chest. 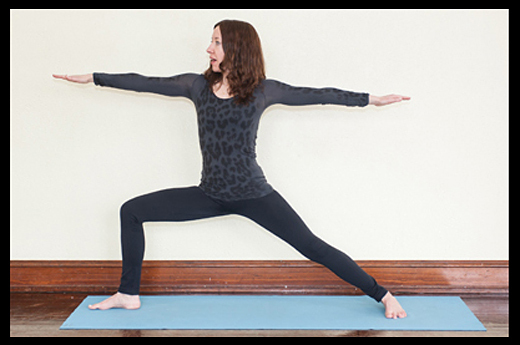 •	To come out of the pose, keep your right knee facing forward as you straighten your leg. Turn your right leg back to face forward and then repeat on the other side. Self-study: Standing poses offer a connectedness to the earth element through the feet and legs. Does that union with Mother Earth, done with the physical body, affect the state of your mind? •	Start on your hands and knees with your hands apart so that your inner wrists are in line with your inner upper arms. Your arms should be angled away from your hands and your thighs perpendicular to the floor. •	Lift your chest and roll your shoulder blades onto your back, as you did in Tadasana. •	Exhale and raise your knees and thighs up and away from the floor, maintaining the extension of your arms. •	Lift the top of your thighs up toward the ceiling and then stretch your legs as far away from your trunk as possible, taking the back of your legs toward the wall behind you. •	Exhale and lower your knees back to the floor. 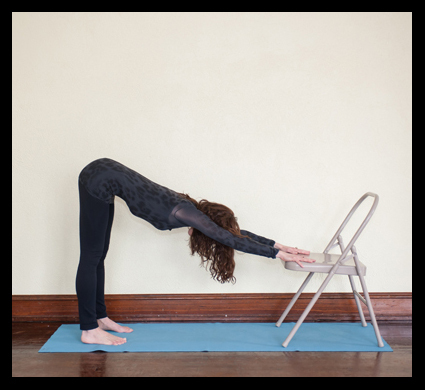 •	Note (see picture below): If you have lower-back or shoulder issues or restriction in your hamstrings, take your hands to the edge of a chair seat and walk back into a modified version of this pose. Self-study: Postures that are done with the head below the heart remove fatigue. When you are feeling tired, ask yourself, is this fatigue purely physical or does it have a mental and/or emotional component as well? What is the “it” that is causing me to feel tired? •	Place a thickly folded blanket on the floor and lie down on it with your knees bent. See that the blanket supports you evenly on both sides, from a few inches above the top of the back of your pelvis up to the back of your head. •	Take the soles of your feet together and your knees out to the sides, with your heels a couple of inches away from your pelvic floor. If you feel any pulling in your inner thighs, hips, or lower back, support your outer thighs with pillows or yoga blocks, if you have them. •	Keeping your body still and relaxed, close your eyes and open your ears to the sound of your breath. Observe where your inhalation ends and where your exhalation begins. •	Raise your arms overhead, bend your elbows, and hold your forearms. Slowly over the next few breaths, move your inhalations farther up into the space inside your chest while making your exhalations longer, slower, and deeper each time. •	After a few minutes, return to normal breathing and allow yourself to rest sweetly in that serene, clear space that is always present inside. Self-study: Deep exhalations are soothing to the nervous system and an antidote to the busyness of life. When you began this exercise were you holding your breath? How did your breath change as your body relaxed? Best yoga teacher in the area. So glad to see Holly-ji’s face and sequence here! Stay warm! Thanks Holly for the reminder, since I’m cold a lot lately. I miss your wonderful classes. You are awesome! I don’t practise in the studio as often as I would like. I do, trust this sequence and especially Holly when it comes to uniting the physical, mental, and spiritual elements. A beautiful sequence anyone and everyone should try. Holly is a wonderful guide to the yoga world and I have full faith in all her teachings. 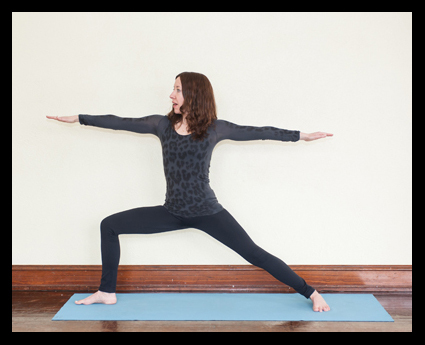 Home practice in winter is truly essential and this sequence is a great way to keep the soul warm. Thanks, Holly. Great reminder to embrace to present, rather then suffer through it! A great sequence from a great teacher. I feel warm already:) Thanks for the winter boost-up! I do in-store demos for 20 different companies and also participate in yoga. I love Aerial yoga. Live in Sarasota, Florida and sometimes do yoga at Siesta Key Beach #1 best beach in US voted by Dr. Beach). My daughter in Brooklyn,NY is studying yoga to be a teacher. Love your poses to clear away old stale energy!! Holly’s yoga teachings are so perfect and precise! Thank you for sharing this sequence with us, Holly. So very grateful I can bring your teachings with me where ever I go, timelessly! Namaste. Having practiced this sequence several times in her studio and at home I can say it works wonders. Holly creates the most intelligent sequences that are tempered through her heart. She is actually teaching Yoga during every class she leads. 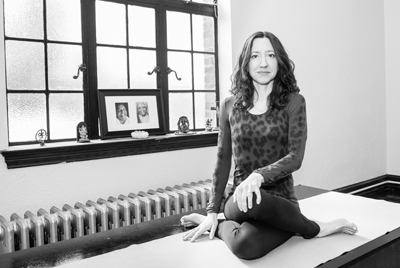 Her teaching goes far beyond asana and incorporates alignment, anatomy, Pranayama, and the spirituality of the Yoga Sutras. I do consider all of the ideas you’ve offered for your post. They are very convincing and can certainly work. Still, the posts are too short for newbies. Could you please lengthen them a little from subsequent time? Thanks for the post.